Bovada is our favorite sportsbook for U.S. players. They are one of the most recognisable names in online gambling with an excellent reputation for prompt and hassle-free payouts. Try their app today! Bovada (formerly known as Bodog) is one of the oldest and best know online sportsbooks operating today. Bovada is also one of the few online bookmakers who accept players from the United States. Their mobile app carries lines on major U.S. sports such as football, baseball, hockey and basketball, as well as soccer, tennis, MMA, boxing and rugby. The Bovada betting app offers United States punters the chance to place mobile bets from iOS, Android and most other types of smartphones. 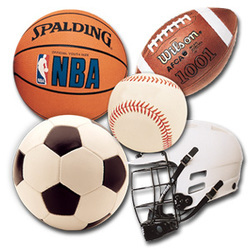 In play betting is also available as well as props, parlays, teasers, futures and more. Bonus: 50% deposit bonus up to $250. BetOnline are a reputable U.S. friendly bookmaker who have been in operation since 2001. Their app is not as slick as Bovada's but it still gets the job done. Their mobile site is super fast, supports in-play betting and is compatible with all types of internet enabled phones, including iPhone, Android, Windows Phone, Nokia Symbian and Windows Phone devices. Bonus: BetOnline offer a very generous 25% lifetime deposit deposit. While many bookmakers only offer a bonus on your initial deposit, BetOnline will give your 25% in free plays for EVERY deposit you make. They will also give you a $25 free bet when you place your first in-play bet via the apps live betting feature. DUE TO EXCESSIVELY LONG WAITING TIMES TO PROCESS WITHDRAWALS, WE NO LONGER ADVISE OUR READERS TO USE CARBON SPORTS. Carbon Sports is currently the most advanced mobile sports and horse race betting app available to United States citizens. 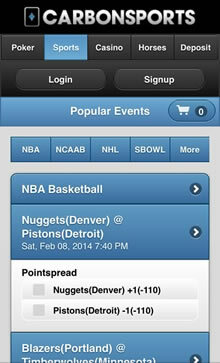 The bookmaker app is well laid out, featuring all the major sports like NBA and NHL along the top for easy access. 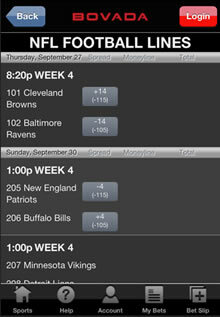 The "Most Popular Bet" buttons allows you to see where the action is happening at any time of the day or night. Carbon is iOS, Windows Phone, Android and BlackBerry compatible. CarbonSports Mobile is also the only full racebook app currently available to racing fans in the United States. Betting coverage includes every greyhound, harness and thoroughbred racetrack in U.S. The racing section also provides a detailed racecard with information on jockeys, trainers and each horses racing form. Do any of the United States facing mobile sportsbooks offer horse racing? Yes, it is now possible to place a bet on any U.S. horse race via the Carbon Sports racing app. Their iOS, Android, Blackberry and Windows compatible web app covers every race from every racetrack in the U.S. and also a few from the UK and Ireland. The Bovada and BetOnline apps do not offer a full racebook, although they do allow you bet on big races like the Kentucky Derby, Preakness Stakes, Belmont Stakes or the UK Grand National. Can I watch a live stream of sporting events or horse racing via any of the U.S. friendly bookmaker apps? No, while it is possible to watch live streams of horse racing, baseball, basketball, soccer, tennis, football and more via the United Kingdom based betting apps like Paddy Power apps, none of the U.S. bookmaker apps currently have a live streaming facility. Why can't I find any sportsbook apps in the iTunes App Store or Google Play? Apple allow sports betting, poker or casino apps in their App Stores on a county-by-country basis, depending on the legality of online gambling in that jurisdiction. Since online gambling is currently only fully legal in Nevada, Delaware and New Jersey, Apple have made the decision to not feature any real-money gambling apps in their U.S. App Store. Google on the other hand have opted for a global blanket ban on any type of gambling related applications. Do USA friendly bookmaker apps also feature European or Australian sports? Yes, these betting apps also feature sporting events and leagues from around the world. For example, you can place mobile bets on cricket, rugby, or soccer matches in the English Premier League, UEFA Champions League, German Bundesliga or Spanish La Liga. Will any of the apps reviewed on this site work on older phones? Yes, you don't need to have a Samsung Galaxy 4, Blackberry Z10 or Nokia Lumia in order to place bets on the go. All of the U.S. friendly sportsbooks featured on this site have opted so develop web apps that do not require any software to be installed. All you need is an internet enable phone with a browser and you should be ready to go. Do you have a question you would like answered? Just let us know via the contact form below. For a true American sports fanatic, it is mandatory to have teams and players available at the click of a button – and while a television set or a laptop aren’t always at the reach of our hands, a smartphone most of the time is. Over the past few years, sports apps for Android mobile devices and iPhone's have become increasingly popular and sophisticated, so it should come as no surprise that they give us access to numerous services, such as free tipping and advice, live video feeds and even price comparisons if sports betting is really your cup of tea. Whether you enjoy watching NBA, NFL, NCAA, NHL, NASCAR, baseball, boxing, golf or mixed martial arts, whether your favorite sports star is Tom Brady, Derek Jester, Kobe Bryant, Peyton Manning, Tiger Woods or Anderson Silva, the mobile apps have you covered when it comes to the latest results and high definition live streams. Quite obviously, the opportunities those apps offer don’t end there, as many software packages allow you to access exclusive news and reviews written by well-known sports writers and on-air personalities, as well as all kinds of useful statistics, including records and current standings. Video streams aren’t limited to live transmissions from the ongoing events, as the best apps will allow you to watch highlights, interviews and additional content; for example, the FOX Sports mobile app allows you to view the hourly “FOX Flash” update of all the top stories, as well as original programming from the “Lunch With Benefits” series. Another cool feature of the mobile sports apps is the possibility of customizing your user experience – many apps allow you to store your favorite sports, teams and leagues, which enables you to quickly access all the content you want in the future. Consequently, checking on the teams you love is a matter of a few taps on your touchscreen and doesn’t require you to navigate through countless menus and tabs. On the other hand, if you prefer horse racing to traditional sports there are many apps that will provide you with the same level of functionality and quality of content. Despite the fact that the major horse racing events take place at a variety of racetracks, there are numerous apps that will ensure that you’ll never lose track of what’s going on in the horse racing world. Even though the competition is almost always very tough and the top horses constantly change, using the best horse racing apps will help you stay ahead of the curve. Whether you seek information about what’s been going on at the Atlantic City Aqueduct or the Keeneland Race Course in Lexington, with the right iPhone or Android app the latest news are always just a few clicks away. The races covered include Withers Stakes, Spinster Stakes, First Lady Stakes, Federico Tesio Stakes, Derby Trial Stakes, Queen Elizabeth II Challenge, Breeder Futurity Stakes, Borderland Derby, Tampa Bay Derby, Rushaway Stakes, San Miguel Stakes, Santa Anita Derby, Illinois Derby, Louisiana Derby, El Camino Real Derby and more.